I use Buffer for most of my social media activity. By scheduling tweets, Facebook posts, and the like to go out at specified times, I am able to get my content in front of people when they are most likely to be using these various platforms. And since I am rarely online when my followers are, this helps considerably. As happy as I have been with Buffer, it lacks some important features offered by a growing number of competitors. 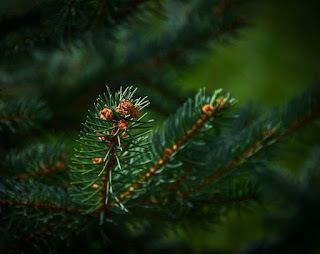 For example, Buffer offers no system for bloggers to use in distributing "evergreen" content. In a blogging context, evergreen content refers to posts that do not go out-of-date quickly. That makes them posts that should be shared repeatedly over time. Most systems set up for distributing evergreen content work in a similar way: the blogger fills a queue with a couple hundred evergreen posts appropriately formatted for social media distribution (this works best on Twitter because of the short half-life of tweets), sets up a distribution schedule (e.g., Wednesdays at Noon and 3:00pm, Thursdays at 9:00am, 11:00pm, and 6:00pm, etc. ), and the system distributes posts from the queue using that schedule. The better systems allow finer control (e.g., the blogger can set the minimum number of days before a post can be repeated). Unfortunately, Buffer does not do this. The good news for those committed to sticking with Buffer is that Buffer allows a handful of plug-in applications that can extend its features. I found one focusing on evergreen content distribution called Hiplay, and I have been testing it using a free 14-day trial of their Basic plan. This is their least expensive plan, costing only $5 a month. Setting up Hiplay to work with Buffer could not have been easier. Unlike some similar services I tried, the Hiplay setup worked exactly as they described it. Hiplay's Basic plan allows the user to connect 3 social media profiles and to store up to 200 evergreen posts in the queue which can be grouped into up to 3 categories. I suspect most bloggers interested in Hiplay are going to want to go with the Popular plan for $10/month. 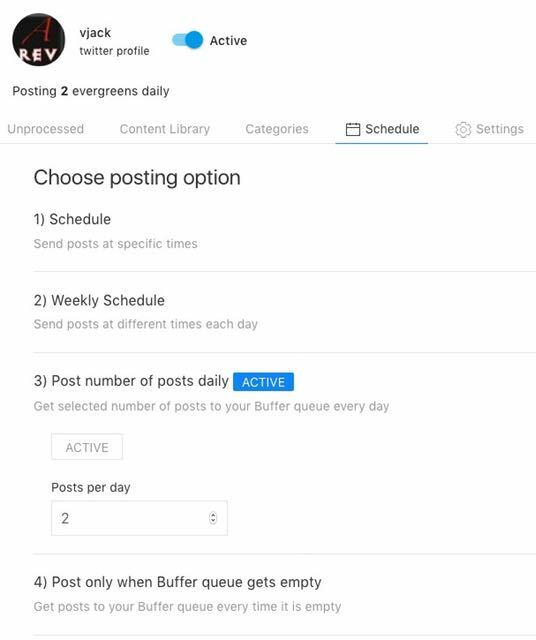 It lets the user connect 10 social media profiles, store 500 posts in the queue which can be grouped into 10 categories, and allows weekly scheduling (I'll explain that below). I connected my Twitter account to Hiplay. Hiplay then pulled recent posts that had gone out on Twitter through my Buffer setup into its Unprocessed tab where I could delete, edit, or click "add to library" to designate a tweet as evergreen content. This worked smoothly once I figured out that Hiplay only had access to tweets that had been sent through Buffer. The tweets I added to the library could then be found under Hiplay's Content Library tab. From here, they can be reviewed, edited, or searched. I set up two categories under the Categories tab: evergreen and promotional. I figured this system would be handy since I had used something like it with similar services. Hiplay's Schedule tab is probably the most important one for understanding exactly what the service does and the various ways one might want to use it. Users are presented with four options, and strangely, only one can be active at a time. The Schedule option allows the user to set one or more times for each category (in my case, evergreen and promotional) and select which days one wants content distributed at each time. This option is limited in that one can pick times and days but not select different times for different days. That is, I can set it up to send an evergreen post out at Noon on 1-7 days of the week, but I cannot set it to send one out at Noon on Tuesdays and Thursdays and another one out at 10:00am on Mondays, Wednesdays, and Fridays). The Weekly Schedule option appears to do this; however, I was unable to test it because this option is reserved for the higher plans. This is probably why most bloggers interested in Hiplay would want to go with the Popular plan. If they want to be able to set up a schedule where posts go out at different times on different days, this should allow them to do so. Of course, not everyone will use this feature. The "Post number of posts daily" option was the most interesting because this one allows the user to specify a number of posts to be added from the Hiplay queue into the Buffer queue each day. This is exactly the feature that Buffer needs to include but doesn't. Suppose I set this up with 2 posts per day specified. Hiplay would then automatically move two of my evergreen posts into my Buffer queue (I can specify whether they are added to the top or bottom of my queue). This would be very handy indeed. The only limitation I ran into here was that Hiplay provides no way to select which categories the posts come from. After setting up my evergreen and promotional categories, I noticed that Hiplay was only pulling posts from my promotional category. I think that Hiplay needs to set up their system so that one can enter the number of posts to be pulled per day by category. That would be far more useful. The final option, "Post only when Buffer queue gets empty," is one I would never use since my Buffer queue has never been close to empty. I suppose this could come in handy for those looking for a true auto-pilot approach where they didn't have to interact with Buffer at all and only wanted Hiplay to step in if they did not have anything queued up in Buffer, but I don't think I'd ever use this option. Although Hiplay does not work without Buffer, the cost of entry for those already using Buffer is not bad. If you can live with the limitations of the Basic plan (i.e., you are not interested in the being able to send posts from Hiplay at different times each day) and are primarily interested in being able to keep your Buffer queue stocked with evergreen posts, the $5 for the Basic plan may be worthwhile. An unexpected advantage of Hiplay is that by integrating with Buffer, it sends all its tweets through Buffer. That means that you have access to the same analytics data Buffer provides and can examine the performance of your tweets from within Buffer. This is a real advantage over stand-alone systems that do not integrate with Buffer and something I ended up appreciating more than I thought I would. If you are not already using Buffer, you might find that one of its competitors offers similar functionality as what you'd get from the combination of Buffer and Hiplay for the same or even less money. I thought the most important limitations of Hiplay included their restriction of the Weekly Schedule option to more expensive plans, not allowing users to use more than one scheduling option at a time (e.g., I'd like to use both the "Post number of posts daily" option to add evergreen content to my Buffer queue and the Weekly Schedule option to distribute promotional posts on off times), and the inability to specify which categories the "Post number of posts daily" scheduling option used. Depending on how one plans to use Hiplay, some of these might be bigger drawbacks than others. I should also note that Hiplay does not make it particularly easy to enter content manually. 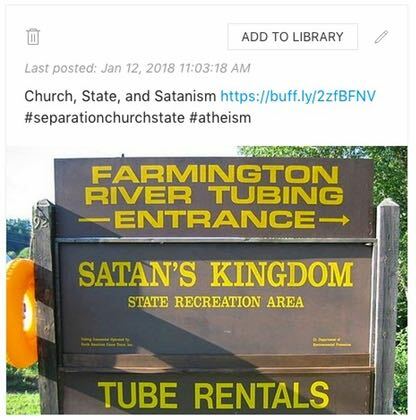 When I'd add a post with a link, it would not automatically pull in the image like almost every other service does. If I wanted to upload an image manually, I could do so but only by deleting the content and starting over. For some reason, editing an existing post does not give one the option to upload or change the image. Since the Unprocessed tab seemed to work well, it probably makes more sense just to use it instead of manually entering content. I am looking for a system that does two things well. First, I want an automatic (or close to automatic) way to refill my Buffer queue with the sort of evergreen posts I want to send out repeatedly. Hiplay seems to do this reasonably well even if it does not give me as much control over which categories content is drawn from as I'd like. Second, I want an automatic system for distributing promotional content on a varying schedule I set up. It sounds like Hiplay can do this starting with the Popular plan. Unfortunately, it does not appear that I can have two different scheduling options active at the same time. Thus, I can't use the automatic re-population of my Buffer queue with evergreen content while simultaneously having Hiplay send out promotional posts on a schedule I set up. The workaround would be to have it transfer promotional content into my Buffer queue. This is not ideal for my needs but is probably workable. For bloggers who are using Buffer and would prefer to stick with it but would like to be able to designate posts as evergreen and have them automatically returned to their Buffer queue, Hiplay is easy to recommend. Use their 14-day trial to put the service through its paces and see if it will meet your needs. Depending on how many social media accounts you have and whether you'll need the Weekly Schedule option, you might even be able to get by with the Basic plan.